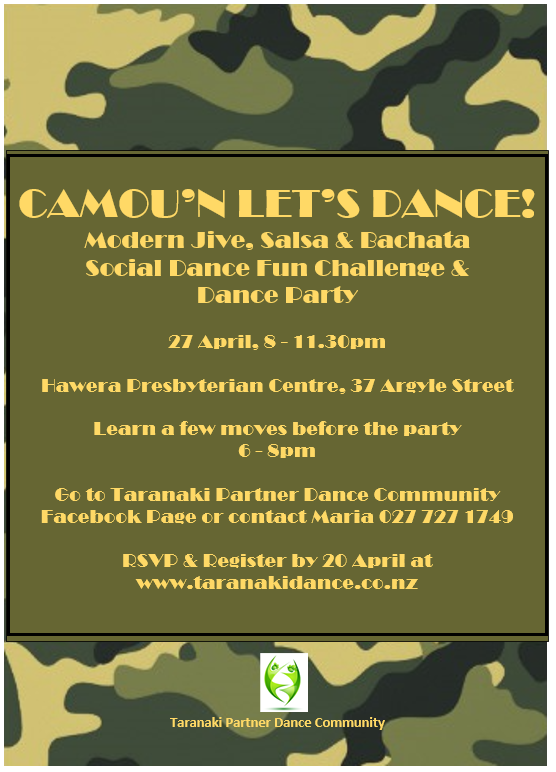 Comments: Specify if you are registering for dance classes (include the term period), private lessons (include preferred dates and time), wedding package (include preferred dates and time), dance party (include date), workshop (include dates) or the Taranaki Social Dance Fun Challenge (include dance style, level and if you're a lead or a follow). FOR ON-LINE PAYMENTS: Please make the payment 2-3 working days before the event date to allow for your payment to show in the bank. Refer to Fees for payment details. Confirmation will be sent to your email once we receive your registration, booking request and payment. Thank you. DIRECT CREDIT – Payment should be made by 18 April (for Early Bird Discount) or 23 April (for Standard Fee). Please allow 2-3 working days for payment to show in the bank. BEGINNER OR NEWCOMER: dancers who have danced for 12 months or less. To place you need to: dance on time (slow & fast music), freestyle a minimum of FIVE moves, be able to lead and follow, and HAVE FUN! To place you need to: dance on time (slow & fast music), freestyle a minimum of TEN moves, be able to lead and follow, good connection & technique, and HAVE FUN!